Shannon McNally is stomping her boots on the stage of the Fox Theatre as good as any other night crawler out there as she growls into the microphone like an early rocakbilly queen. Her voice croons over the upright bass of Amy Lavere, Shannon’s partner in crime in their band Chasing the Ghost, which they started after a collaboration with Luther Dickinson of the North Mississippi Allstars. It isn’t usually the first thought of the evening to catch the opening band, but Shannon’s name and reputation has eluded me for years and I thought it was finally time to catch the southern beauty. She’s playing her own brand of coalmine country rock and it feels like we’ve been transported into a scene out of Jackrabbit Slim’s in Pulp Fiction. The band is raw; no glossy additions or souped up displays, only Shannon clutching her black Stratocaster and preaching to us about railroads, heartbreak, wilderness and whiskey. When they end, I realize Shannon strikes me in the vein of her peer Nicki Bluhm or a young Wanda Jackson. Northern California bluegrass favorites Poor Man’s Whiskey take the stage following a short changeover, and wastes no time introducing themselves to the crowd and letting us know that it’s their first show of the New Year. There first number is really rocking, with great interplay between the acoustic guitar and banjo of banjo of lead vocalist Josh Brough. He hoots and sings, “we’re going out tonight, it’s Friday night,” through a wide smile that doesn’t vanish for more than a few moments for the entire set. Their name says it all; a hard pressed bluegrass band making a living on the road and fighting off the hard times together with a bottle of man’s best friend. Recognized for covering Dark Side of the Moon in its entirety, these NorCal bluegrass boys wearing a congregation of collared shirts separate themselves from the rest of the pack by paying tribute to their Northern California homeland through numbers such as “Sierra Girl,” and the especially rocking and aptly named “Humboldt Hoedown.” Their knowledge of the area and knack for descriptive, pictorial representations of the land they obviously hold dear to them, as they claim California is “In my heart and on my mind” on the song “Goodbye California.” They write narrative accounts of travels through the hills and mountains of the sierras, and love songs to the few ladies to be found in Truckee. To me, the bluegrass, jug band feel of traditional Americana music combined with their western travel oriented lyrics and pastoral descriptions make this band a relic in the best sense of the word. I head to the bar during “Sierra Girl” and naturally order a Sierra Nevada. The room is filling up fast and there’s still a large crowd outside with a collaborative plume of smoke rising into the near-wolf moon sky. 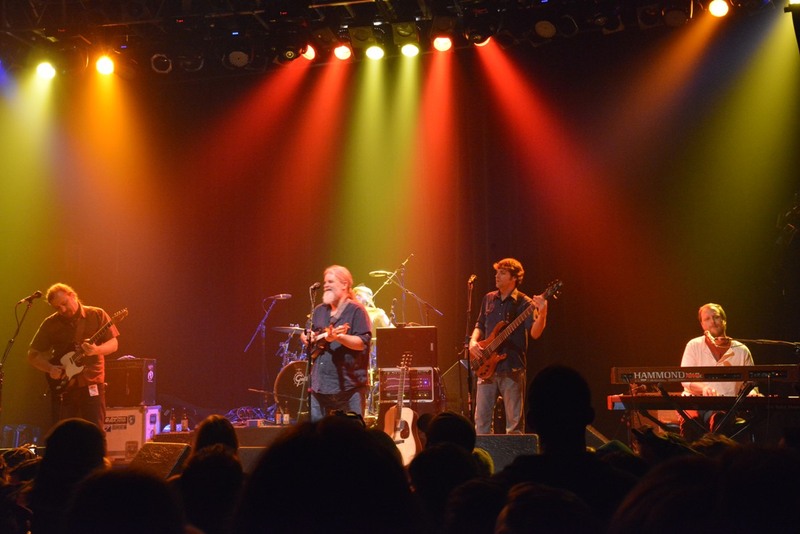 The band launches into a few covers, including a very funky “Boogie on Reggae Woman” by Stevie Wonder and one of my favorite often played Jerry Garcia Band covers, “Catfish John.” Their slow, melodic take on this one made me feel right at home, and the inspiration for their own songwriting evident. A bit of a heavy jam showing the Pink Floyd and Grateful Dead influences helps bring their set to a close and a strong crowd to the bar. Aside from occasionally taking a leap instead of a step, Poor Man’s Whiskey is a strong-minded bluegrass band with a fresh take on lyrical depth and a real understanding of turning everyday surroundings into emotionally charged tunes. In terms of what defines music found in the Great American Songbook, Poor Man’s Whiskey is helping to keep the standard alive. Speaking of the Great American Songbook, Great American Taxi embodies it with their rich lyrics and western rock and roll twang. 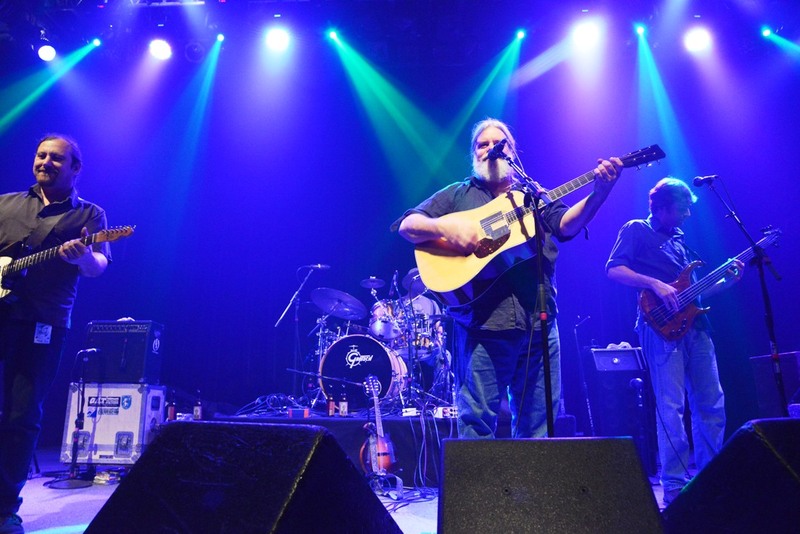 Front man Vince Herman of Leftover Salmon notoriety and resident of Boulder for years has a warm, grizzled voice and personality on and offstage, and is always plucking and strumming away at his acoustic guitar or mandolin. Hardly classified as bluegrass, GAT is rural rock and roll in the Americana style that folk ballads were born from. Their songs tell the stories of mankind: of poor men living off the land without so much as a dollar in their pocket; of hopeful glints in the eyes of unfortunate fated castaways; of packing the family and the farm and moving away from the dissolution of once grand prospects and love affairs. Through a series of self-penned melodies, traditional tunes and choice cut covers, GAT has the Fox hanging to every word, leaving us longing for adventures across the great highways, mountain divides and rural back roads of America’s past. The Boulder crowd has shown up in force to the Fox Theatre for Great American Taxi, a band with deep Colorado roots. The dance floor swings and sways to the boogie of the rocking band Vince leads around the country. “Unpromised Land,” helps to get things rattling as Vince sings the blues for a woman who got away and how it might be time to pack up and move on. Keyboardist Chad Staehly has the organ whirling over the string instruments and adds a healthy dose of vocals before an absolutely shredding guitar solo that flash floods through the PA by way of Jim Lewin. “Poor House,” one of the more popular tracks off their most recent release, “Paradise Lost,” is a romping good time. The vocal harmonies shine on this number, and Vince’s moan sounds like a rusted chewing tobacco spittoon left on the rotting front porch of a southern home. The crowd really sways to this number, and Vince has a certain swagger that he exhibits just in stance as he wraps his big arms around his acoustic guitar and sings to us about a woman plunging the frail finances of a man into the ground, though he had little to begin with in the first place. The band holds a meeting on the mound, in this case the drum riser, and he lights are dim and Vince sets down his acoustic axe in exchange for his mandolin. Out of their breather, Staehly takes a step towards the microphone and bolts into the Gram Parsons’ classic, “Big Mouth Blues.” Being an avid Gram Parsons fan, I make my way through the crowd thick as cotton fields to get in on the action. “Well, I once knew a man who sailed the world twice, he would have made three but he took a lot of bad advice.” In what could serve as any definitive anthem, the frilled account of deception and revenge is right at home in the hands of Great American Taxi. It isn’t everyday that you hear a band cover Gram, and I couldn’t think of a better fit to play the country rock that Gram helped build to a boil with bands like the Byrds, the Flying Burrito Brothers, and of course his solo work with a then relatively unknown Emmylou Harris. That genre of music has a large influence on GAT, as the traditional Americana pioneers and country musicians did on Gram. The Grateful Dead, another band with influence on GAT who developed their own American songbook, including the Vince Herman sung “West LA Fadeaway,” which is always a crowd pleaser and has drummer Chris Sheldon and bassist Brian Adams really laying down the funk. After a few more songs, Vince raps about the Colorado shows being recorded for an eventual live release. It comes as no surprise, because the Fox is known for being one of the better sounding rooms for its size in the country. The band also has their strong roots within the front range. With that, Vince says, “We’re going to let Brian sing one.” Brian Adams takes over the lead vocals for the next song, called “Swamp Song,” also off of “Paradise Lost.” The difference in vocal approaches by the band make the listening experience that much better. While Vince is the primary vocalist, hearing nearly every member singing lead on a song or at least supplying additional harmonies keeps everything sounding fresh and not hanging too many duties on any one member. In what was a truly special evening of friends and musicians turning on the crowd and sharing in the revel, Great American Taxi pulled out all of the stops you’d expect out of a hometown show as well as one being recorded for a future live release. GAT plays their own brand of country, Americana-infused musical stories with a sprinkling of front range bluegrass, but you always know they’re bound to rock.